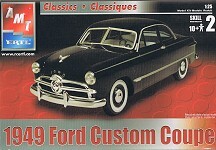 When I saw the picture below in the Belgian magazine Chroom en Vlammen (Chrome and Flames), I knew I wanted to try to model this custom car. It is (was?) 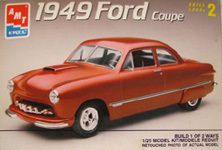 an 1950 Ford, widened, sectioned (taking a horizontal piece from the body) and chopped. I'm generally not a fan of custom cars, but this one I definitely liked a lot. 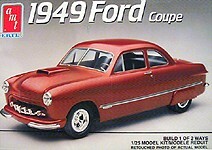 I found out that AMT had a model of a 1949 Ford, which was close enough for me. 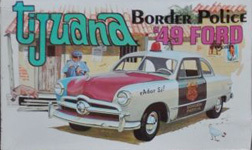 Later I found out that the 1949-1951 bodies are basically the same. It then took a while before I found this kit in a shop. Since it was my first custom conversion, I carefully studied how to cut the kit. I decided I needed drawings first. I photographed the model with the longest lens I had (400 mm) to minimize perspective problems. I then projected the slides on a piece of paper, and drew the model in four views. With copies of these drawings I devised where to cut the kit. I cut up one drawing to see where I best could make sawcuts. The sketching is visible in the scan. 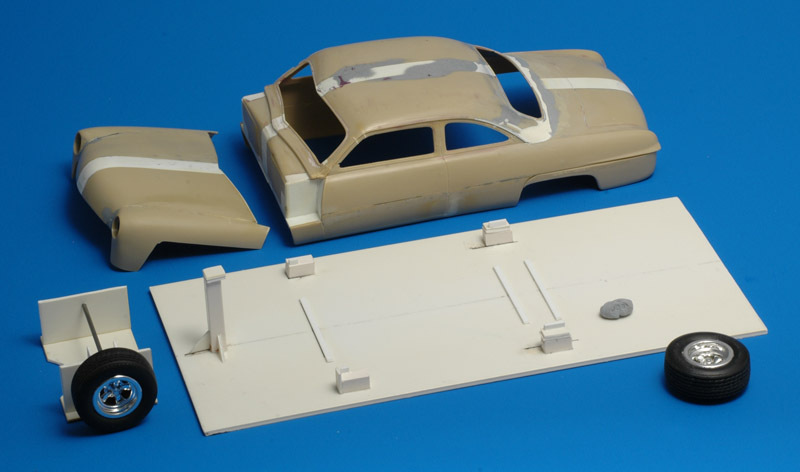 The real car's modifications were: a 120 mm roof chop, a 160 mm sectioning of the sides, and a 220 mm widening. I used the scaled numbers for my conversion. 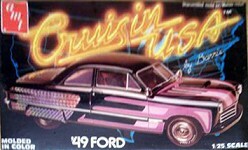 Back then, when I started, I had no access to American car modeling magazines that described how to do it. 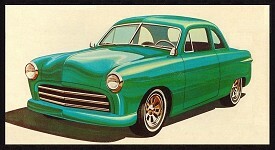 For example Tim Boyd"s article 'Chopping the Mercury top' or Anyone got a link for how to chop an AMT 49 Mercury . It was time for some serious sawing! In contrast to the careful preparations, I immediately cut the kit in 10 pieces. I then had quite a problem getting all the parts properly aligned again.. The photo on the right shows the cut in body sides (6 millimeters), still visible as a vague black line. I also cut off the lower rear part of the rear fenders. The top chop is some 5 millimeters. 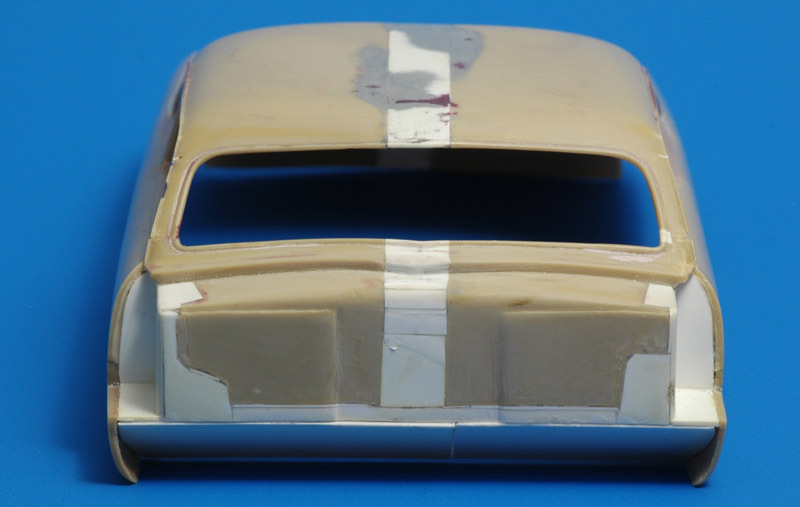 Like the real car, I bent the A-pillars backwards, so the windshield would be at a steeper angle. This was achieved by making '80% percent through' saw cuts, bending, and then fixing it with plastic card and superglue. The B-pillars were used as reference points for this, since these were only shortened. The C-pillars were not so easy. Prime concern here was to get rear window right again; the upper side of the rear side windows would be destroyed anyway. The complete C-pillar was cut out, modified and glued back as best as possible. A lot of sanding was needed to get about right again. Since I wanted to build a flip-top hood, I decided to cut off the front end. 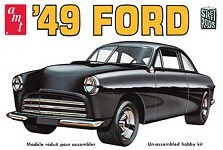 The front end consisted of the engine bay and the front fenders. The holes left by cutting off the front fenders are filled with lots of plastic card. More repairs to the firewall were necessary, and these too were made with plastic card and lots of superglue. Later a transmission tunnel will be cut out. The picture also shows the strip of 8 millimeters used to widen the car. The next photo shows the considerable mess put together again. 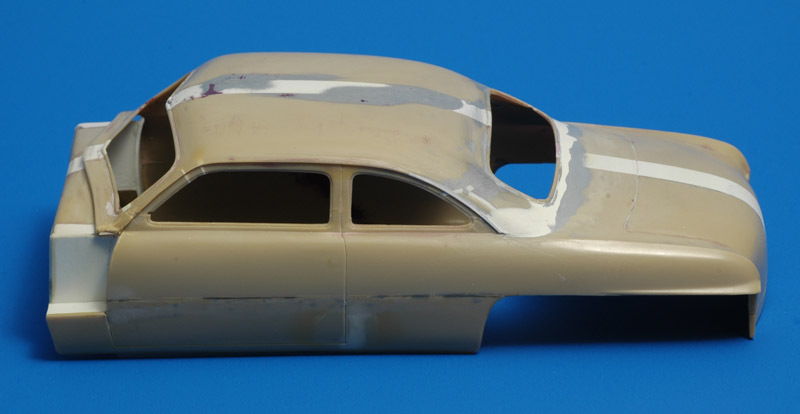 It also shows the front fenders glued to the hood. The model still shows traces of the blue Tamiya putty, but it took me a while to learn that this doesn't work. 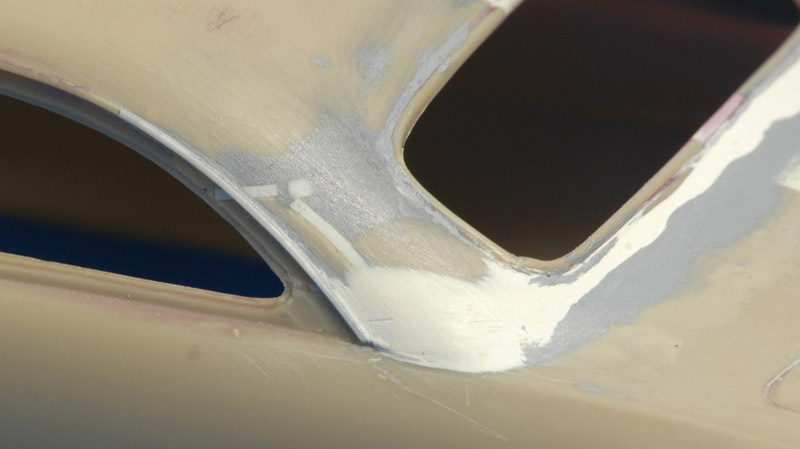 The putty is much softer than the plastic, and sanding keeps creating shallow dents where the putty is. I then switched to super glue, my favorite filler since some time. This improved things a lot. It has been quite a drag to get the body smooth again, but I'm slowly getting there. The A, B and C pillars still require a lot of work, but with a lot of patience it can be done. The rain drip rail was recreated using thin plastic strip from Evergreen. The rear window trim still needs some work. While working on other models I learned the value of jigs, and I decided to build one for this model too. It's basically a large sheet of 2 mm plastic card, with raised supports for the body, and a high support for the hood. I also built a simple axle holder, to study the wheel positioning. And this is what the model looks placed on the jig, with wheels. I gave the body a small forward tilt by using different heights for the supports front and back. For the first time I saw that playing car designer is not as easy as it looks.. the model looks kind of weird..
A side view possibly helps in determining what to change. Maybe the wheels/tires are too big? Possibly the rear wheels need to move forward? 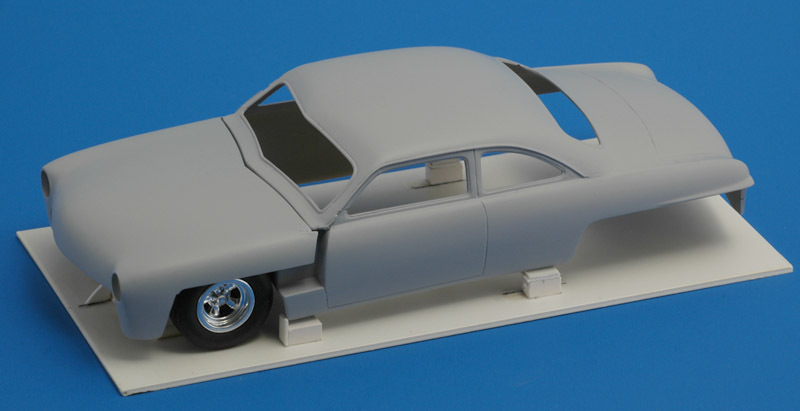 The real car had its boot lengthened 12 mm (in scale), maybe that helps? Not an easy job, since the rear of the car tapers quite strongly. Let's first finish the current modifications. I decided to apply a partial coat of Mr Surfacer to see how the model looked in a neutral color. For the first time I noted that the hood looks strange, since it's now wider than long. Therefore I started adding 1 x 1 mm plastic strips at the rear of hood to gradually make the hood longer until it looks natural. At the same time I realised that I now need to lengthen the boot too, and this will be very complicated. I also found some waviness in the roof that required more sanding. After some more sanding and layers of Mr Surfacer, here's another look with the longer hood. I'm still not sure about the shape. Maybe the opening ahead of the door (like the real car) doesn't work. Another view. I'm not sure which angle to use to judge the shape. I don't like the bird's eye view because that's not how you view real cars. 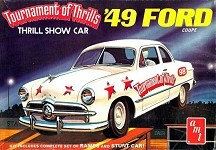 But model cars are often viewed like this. These versions could be ordered with the less-expensive 'Standard' or more expensive 'Custom' trim levels, making for example a 'Custom Club Coupe'. This is what the standard version in this AMT kit represents. The first boxing is also clear about this (see below). 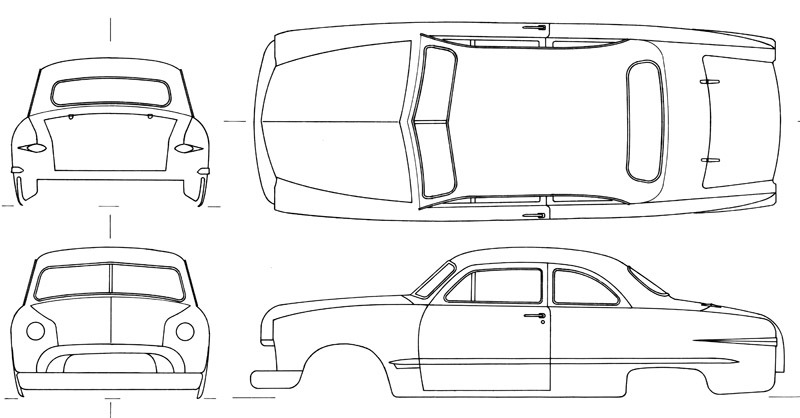 On the MCM forum, 'Modlbldr' shows his conversion of a '49 Club Coupe to make a '50 Tudor Sedan. My boxing contained lots of other parts, that can be traced back to the five issues between the original and my boxing. I compiled an overview of all boxings that I could find on Ebay and Google. After having seen all the versions in this kit's history, and their instruction sheets, I finally understand the purpose of many of the extra parts included in my AMT-Ertl #6580 edition. 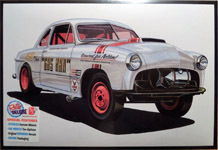 For example the second engine represent an early Cadillac engine that was popular among hot rodders in the early fifties. It's a first-generation overhead valve 331 ci engine from 1949. 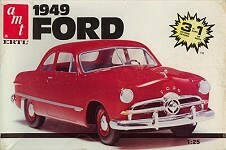 It was later enlarged to 365 and 390 ci until 1962. The kit engine has Tri-power and blower options. 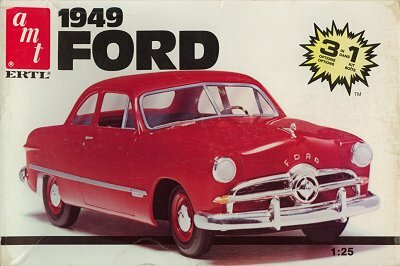 The Plastic model kit instructions site has a ton of old instruction sheets.